This blog is designed to be an easy resource for skiers and ski club advisers. It will give detailed unbiased information about resorts big and small. Enjoy. Spring skiing at it's finest! 120 trails, 75/80 degrees, bikinis, tank tops, shorts and T-shirts. And cold Long Trail IPA to end the day. Our after lunch runs on Saturday have been named "the double diamond tour". We hit soft bumps on Big Dipper (glade), Double Dipper, Downdraft, Cascade, Escapade, Flume, and Ovation (up and low). We parked trail side and tailgated at the end of the day near Snowdon Triple. 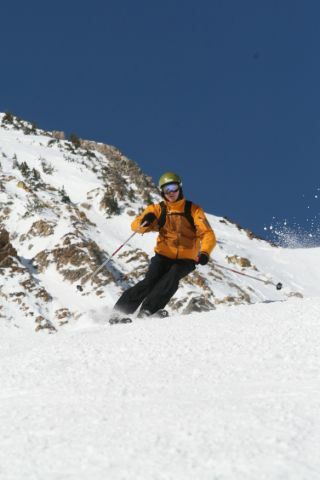 Anoth er year and another sunny week in Big Cottonwood Canyon. Again we hit the slopes with spring conditions. It snowed the week before we got there so there was plenty of the white stuff. (It also dumped for weeks after we left.) We are having a tough time catching powder. I'll be posting my resort guide shortly. Honeycomb canyon is beautiful. Solitude has some real awesome terrain. It takes a day to get used to "how" it is set up. At first, the lifts seem to be in odd places, but after a day out there the puzzle of Solitude became quite clear. So be patient and give yourself a couple days. The Inn at Solitude village was real nice. For the price, they should include the lift tickets. See my full report. Warm and sunny conditions this week. We are here during the 5-day lull between storms. The powder gods are not on our side. Regardless, Alta was pretty awesome. Cathrine's area never got soft enough to ski but the rest of the mountain(s) softened by 10:00 AM as the temps neared 50. It was sweater skiing for 2 of the days as temps hit 55/60. Our favorite areas: Glory Hole, Devils Castle, and of course Ballroom. We spent most of our time at Alta. We hit Snowbird for a couple days but the front side just refused to soften. Mineral basin was the place to be. We spent 2 mornings here as it faces south and warmed up quickly. It was 100% open and a blast! We headed back to Alta in the afternoons and finished our days. We stayed at Gold Miners Daughter (affectionately known as GMD). GMD has a package deal which includes Breakfast and Dinner. The price was up there but the convenience of being slope-side is unsurpassed. The food was excellent! The GMD is showing its age but is still a very quaint and rustic place. The staff was excellent. But wouldn't you be excellent too with 135 days out and its only the second week in March? Great goggle tans on everyone, too. Breckenridge is a great resort town. The mountain has plenty to offer too. There are 4 huge peaks and some nice bowl skiing. The 6-chair area was real sweet with a foot of freshies. This is a great group trip destination. I found that the season pass was cheaper then a 6 -day multi-pass. I skied 8 days. The pass was also good at Vail, Keystone, and Arapahoe Basin. I took one day off to snowshoe. I would suggest non-holiday for anyone going. The lines were not bad if you knew the mountain. My personal guide made sure we didn't hit too many lift lines. I took a day to hit Arapahoe Basin (A-bay). This is a sweet place to ski. It's old school...with an old time rustic lodge, down to earth and low-key people, and all-around good vibe. Great conditions, too. I highly recommend a day trip (or 2) here. This blog and it's contents copywrite TheSkiesBlog.com and SkiersBlog.com 2010. All rights reserved. Travel theme. Theme images by AndrzejStajer. Powered by Blogger.